I am trying to get excited about Christmas—which is right around the corner (as though anyone needs a reminder), but I can get a bit “bah humbug.” Christmas music drives me nuts, I think most decorations are tacky, and all the manic shopping and false cheer turns my stomach. I blame my parents, who never once took me to the mall to visit Santa Claus when I was young. 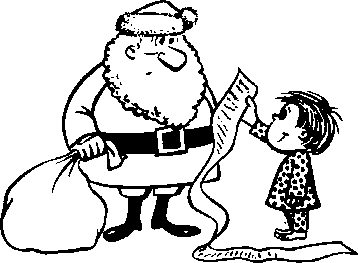 I also never wrote the old man a “wish list.” So here I am, at 37, sitting down to write my very first letter to Santa Claus. I hope this letter finds you and the missus well. I know you are known by many names—Kris Kringle, old Saint Nicholas, but I will call you by your American commercial name for the purpose of this letter. I have been very nice this year: kind to neighbors, generous with my time and energy, a compassionate ear in times of difficulty. I have tried not to complain or gripe or whine too much, even though there is much in the world to be grumpy about. I did not participate in as many “Occupy” events as I should have, but New Year’s Resolution time is almost upon us, and trust me when I tell you that will be on that list. So, with that preamble, allow me to give you the list of things I want for Christmas this year. Of course, there is very little that I need—other than very warm winter outfit that will not be too bulky or down-fashion (I am going to spend the first two weeks of January outside demanding that President Obama shut down Guantanamo, close Bagram, end torture and ensure accountability for the architects of this travesty). So, put that at the top of my list, please. Warm, not bulky, winter coat. This Patagonia one is really nice, but it is made in China. Never mind about that. I’ll just layer up. Other than that… hmm. I thought long and hard about how to make this a real Christmas wish list and not just a list of all the ills in the world that I want changed. Food for hungry children. I know that you have an enviable distribution network, so in addition to toys and tchotchkes, could you also hit up all the hungry kids with nourishing food. There are about 16 million “food insecure” kids in this country, so it will take some effort. Good places for all the Occupy folks to be for the winter. A lot of people dropped everything and “came home” to Occupy Wall Street, Hartford, San Diego and countless other upspringings around the country. They found community, meaning, a platform for their outrage and alienation—and the daily necessities in those anarchic and somewhat miraculous spaces. Now, with spots like Zuccotti Park closed to Occupiers around the country, many of those friends are looking for a place to go. In Providence, Occupiers put it to the city. We’ll leave the park if you open a day shelter for the homeless. Peace. It’s not too hard, right? I mean, you can fly through the air behind eight tiny reindeer. That stretches the bounds of credibility just as much as the belief that humankind can all breathe air and share space without killing each other, right? Well, maybe it is all a stretch. But especially right now, as the killing returns to Iraq with a vengeance, we need a little help in the peace department. Wasn’t President Obama just crowing about the end of war in Iraq? And now, the papers are full of news of a new wave of bombings and a crippling political crisis: 63 dead in Baghdad and more than one hundred wounded on Thursday. Good work and more time. I am happily unemployed and feel really privileged to spend my time doing things other than making money. But, I know so many people who are out of work or who are really unhappy in their jobs. And beyond being unfulfilled or bored, there are countless people working in dangerous and unhealthy environments—mining, machine shops, fishing vessels, farms—and who are being exploited. And then there is the modern scourge of slavery and human trafficking. I wish for good work that is meaningful and justly remunerated for all people. And while we are on the subject, just how much are you paying those elves of yours? I could go on and on, there is a lot to wish for better in the world. But, I will conclude my letter by noting that if you are able to deliver all these things to me on Christmas morning, I would be most grateful (and I would not be the only one). My family is making chocolate peanut butter balls and beer to give to friends and family for Christmas, so we’ll leave some out for you. By the way, I don’t have a chimney, but you should be able to figure it out. Best wishes to you too, Brad. I hope all is well. You are right. Santa can only do so much! This is Obama’s mess- or perhaps more accurate to say that it is capitalism’s mess- and I should be writing to him… it would be a much angrier letter than this, tho.